Dressed in a hard hat and oil-stained work clothes, the mechanic paces a dimly lit workshop strewn with salvaged train parts like motors, metal plates and hoses looking for the right piece. In cash-strapped Venezuela, there’s no money to buy spare parts. Years of neglect and corrupt management have left in decay Ciudad Guayana, a would-be Pittsburgh carved from the jungles at the edge of the Amazon. “The machinery that we have, it’s worn out,” said Juan Arias, Venezuela’s minister of industry who was sent by the socialist government in Caracas to fix the once-thriving factory town. Production this year at state-run Sidor, Venezuela’s largest steelmaker, is expected to reach barely 20 percent of its peak production, set a decade ago, he said. At its height in 2007, under private ownership, the factory put out more than 4 million tons. Still, it is eking out more than the year before, raising Arias’ hopes of a shifting trend, despite Venezuela’s lack of hard currency and U.S. sanctions that officials say are starving factories of the resources they need. Venezuela sits atop the world’s largest oil reserves, but low crude prices and a plunge in production have left it in an economic free fall. Ciudad Guyana was long seen as the future of Venezuela. U.S. companies in the 1950s zeroed in on Venezuela’s vast resources, pouring money into factories for turning iron ore to steel and bauxite for aluminum as well as rails and river ports for shipping it to market. Dams on the Caroni River provided abundant hydropower, while workers from all over the country poured into the new city dreamed up by planners from the Massachusetts Institute of Technology. Nearly two decades ago, President Hugo Chavez came to power and launched his socialist revolution. In 2008 he began putting the factories, then owned by conglomerates from Japan and Argentina, under the state’s control. Output steadily eroded even before the oil price crash. Today, a massive dump truck that loads ore onto trains to be sent to the foundries — a lynchpin in the cycle — runs on a tire so badly worn that strips of rubber tread are missing. Twisted piles of train cars that used to transport raw iron ore litter a hillside. They derailed when an engineer was travelling too fast on rails left unmaintained. At Sidor, only two of the four smelting ovens that make steel bars are functioning, and workers who used to operate around the clock put in just one shift a day now, officials said. Hausmann said that reviving Venezuela’s industrial base will require abandoning the socialist model and replacing it with a market economy, motivated by supply and demand. 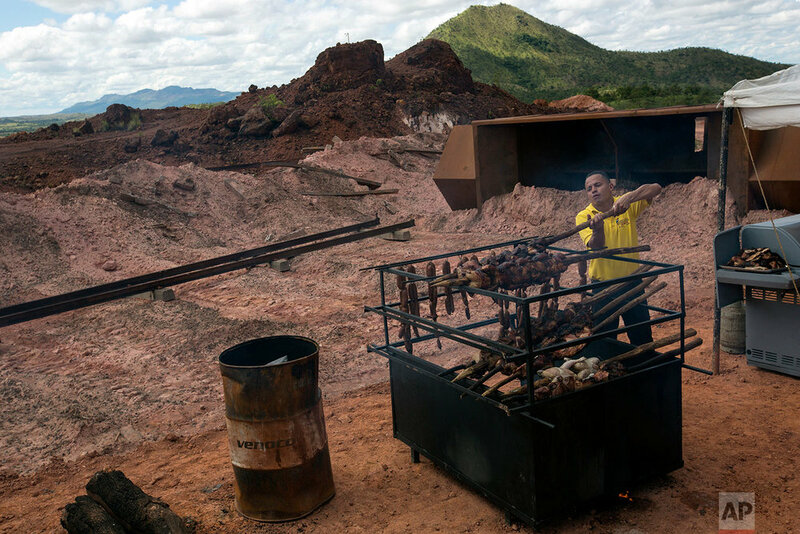 In 2016, Chavez’s successor as president, Nicolas Maduro, launched the nearby Arco Minero project, setting aside a wild swath of surrounding Bolivar state for mining gold, diamonds and other precious metals. It was an idea Chavez had proposed years earlier. Leaders called upon dozens of foreign and domestic companies to invest in the project, which was designed to fill Venezuela’s coffers and break its dependency on oil. So far it has gained little momentum. Isaias Suarez Chourio, who worked his way up the ranks to be named president of another major plant in Ciudad Guayana, Ferrominero Orinoco, blames a long line of mediocre, deficient or corrupt managers who looted the factories’ profits for personal gain, while mistreating workers. Confident a turnaround has begun, Suarez Chourio says a key to increased production is inspiring the respect of workers — from providing them with dignified locker rooms to honoring contracts to pay them. It also requires leading by example, he said. Workers at the state-run factories quietly complain that they once proudly filled the ranks of Venezuela’s middle class, taking their families out to eat and going on vacations. Now, all their money goes to buying food. 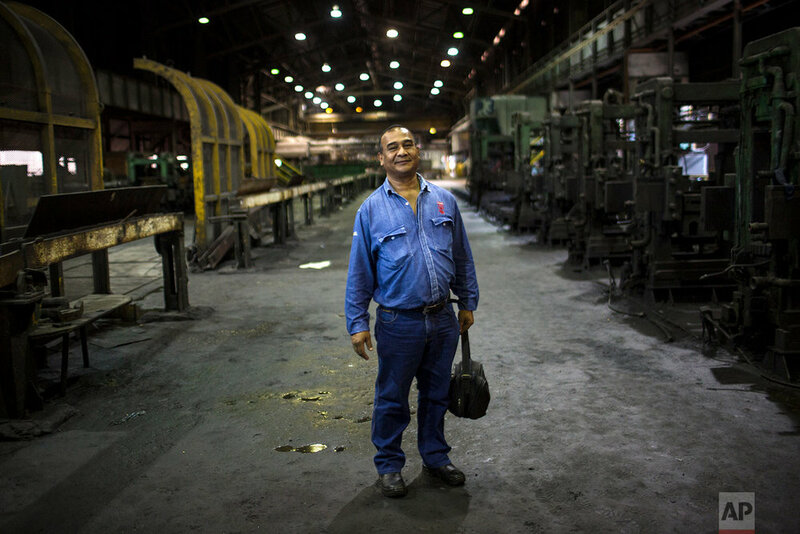 Tony Franco, 50, put on his work shirt after a Sunday lunch with his family and got ready for his night shift at Ferrominero, where he has spent 28 years in electrical maintenance. Franco had to sell his car and now walks several blocks to catch a bus to make it on time for his night shift. Ferrominero is part of his self-identity, and he said he is ready to fight for a better life, not quite yet giving up on the government’s turnaround campaign. Text from the AP news story, Crisis-wracked Venezuela turns for hope to broken factories, by Rodrigo Abd and Scott Smith.